The greatest gubbing of all time! Excuse me while I piss myself, over and over again. The greatest gubbing of all time. 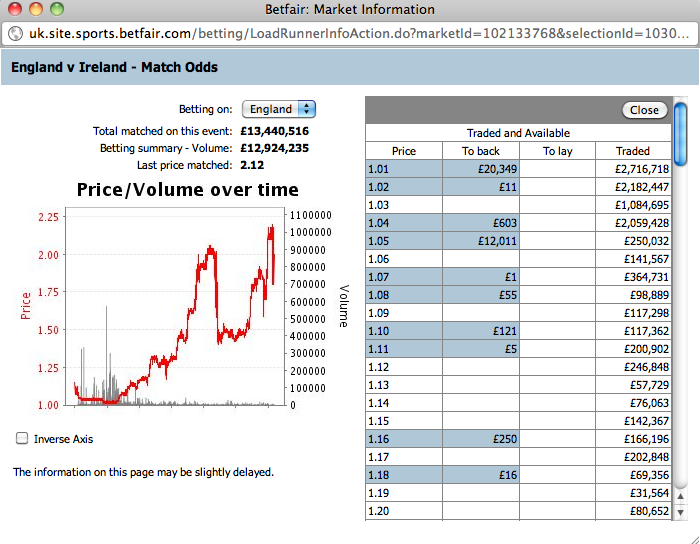 That's over £8 million traded at 1.04 or shorter. Almost £5 million at 1.02 or shorter. 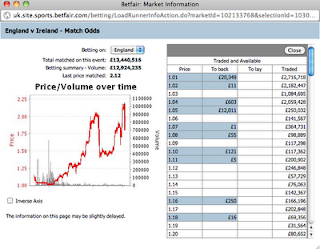 £2.7m matched at 1.01. England, fresh from possibly the best ODI of all-time, the 338 runs apiece tie with India on Sunday. They scored 327 off 50 overs, a huge score against any side. Surely an ICC associate member like Ireland, a complete minnow in the world of cricket, couldn't chase that down? Enter Kevin O'Brien and a magnificent innings of 113 off 63 balls. The fastest World Cup century of all time. England brought their gun bowlers and on this perfect batting pitch, Ireland made them look like village pie-chuckers!